I look after my clubs Website www.clubvw.org.au and through this I met Alexander, unfortunately online only. I wish him every success with his new site and if enthusiasm counts for anything it be a huge success. Warning I’m not a VW purist, I like to modify them, a bit like Dr Porsche did. I was born in Sydney Australia on 2nd of September 1954, that makes me a Oval window with heart shapes taillight's. My friends and I often refer to each others age by the corresponding beetle model. I have lived in Sydney all life. I first became interested in Beetles in 1970 when I went for a weekend away with a workmate that owned a 1967 1300 Deluxe Beetle. These were an Australia only Beetle that had a 1300 cc motor, 6 volts, king & link pin front end, just like a 1965 model Beetle, we then started getting 1500 Beetles from 1968 on along with the rest of the world. We received the 1302 (Superbug) and 1303 (Lbug) along with the rest and our last Beetle in 1976 had the flat screen beam front end and CV joint rear end. 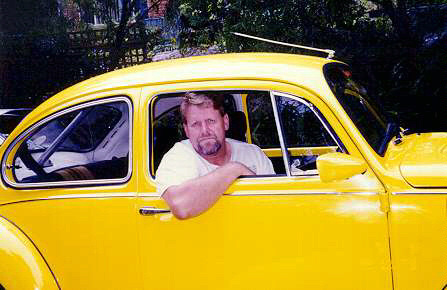 I was restoring a Velocete motor bike at the time and when I told my parents how much I enjoyed my trip away in my friends bug, they happily lent me $500.00 to buy my first Beetle, a 1963 austerity (no chrome no petrol gauge no glove box lid painted bumpers 1200 cc motor) model. 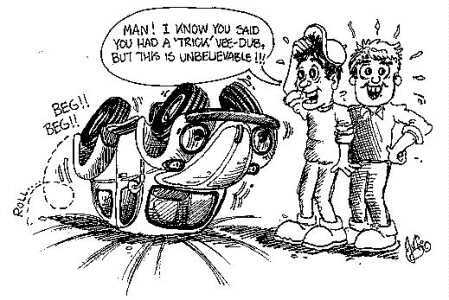 I had that Beetle for some time and fitted a 1500 cc motor 6x13 front wheels and 7x14 wide wheels. It got me to work most days and on weekends I competed in a few motorsport events, didn’t win anything but had some fun. I wrote this car while practicing the Scandinavian flick in the wet one night. I then bought a 1961 model and transferred all my stuff over from the 1963 Beetle, this one lasted until I finally had enough money in 1973 to buy a new Beetle, this was not to happen because by this time the 1303 had been released and quiet frankly I found its looks not to my taste, boy how my tastes have changed since then. So the chase was on for a 2nd hand 1302 in good condition. A work mate (Chris Heyer who now owns a Sydney VW dealer, Penrith European cars) had a friend that wanted to get rid of his 1972 Superbug so a meeting was arranged and I fell in love with my car all those years ago. After getting out of a well sorted 1961 Beetle with wide wheels etc the Superbug lacked a bit in the handling department, the Dunlop B7+ tyres didn’t help much either, so I fitted a set 14x6 inch Hotwire mag wheels with 185/70x14 tyres this helped remarkably. In this time I fitted a Powertune fibreglass body kit which consisted wider fenders a front airdam and whale tail, I changed the wheels to 7x14 Magnum eliminators. In 1979 while working a Sydney VW dealer called Cloughs of Bankstown a young lady walked into the shop and while being served asked me who owned the yellow Beetle outside I answered me and she seemed impressed. I later met the same young lady at pub in the city, she was on a hens night and I was on a bucks night, we chatted for a while a got married the next year. I then started working at a performance VW specialist called Powertune, there I learnt a lot a about making VWs handle, go, stop and last. While working there I fitted 8x14 Magnum eliminators to the rear of the Beetle. Over the years I collected parts to make a killer VW air-cooled engine, new German case, new heads, SPG 82 roller crank, 92 mm pistons and cylinders (specially strengthened by Powertune) 46 IDA Webers, all the good gear. In 1986, After working at Powertune for 8 years and gaining my mechanics licensee I left and became a Patrolman for an Auto Club. I’m still doing the same job now. Just before I left Powertune we dismantled a new 1900 cc wasserboxer engine, I was impressed but I became interested in these motors when the 2110 cc motor was released. In 1987 I sold all my air-cooled stuff except the Webers and bought a brand new 2110 cc wasserboxer motor, I was lucky as I had friends that worked for the importer of VWs into Australia and they got me a European motor with 10.5 compression ratio. I then went about modifying the wasserboxer motor and fitted it to my bug in 1988 just in time for the first VW Nationals at Easter. After this I gradually refined the Beetle with many suspension modifications and fitted some 15x7 and 8x15 local alloy wheels and eventually 8x17 and 9x17 Porsche alloys. Then in 1988 I got tired of the daggy appearance of the Beetles original paint so I had it repainted and also got rid of the Powertune kit and fitted an Aero kit from Vintage VeeDub Supplies. I have had many other cars some VWs and some not over the years but my Beetle has been with me all this time and I hope to keep it forever. The Beetle has traveled in excess of 420,000 kms, with many original parts still fitted. It’s a bit like granddads axe you know 2 heads and 5 handles, best axe I ever had. Steve is a good Cybernetic pal (new version of pen pal) and he sent the information about the inclusion of some Jason van Genderen cartoons in his Site, they are now part of the QUEST's Site, as you can check by youselves. By the way, I asked Steve the following: -"Well, considering the peculiar way your friends refer to each other I'm almost one KDF Wagen, because I was born on 02MAR1947!!!" And he answered: -"You must be a split window with a popes nose".